After Ferndale I stopped in Eureka, on Emma's recommendation, for a cup of hot tea at Old Town Coffee and Chocolates. I've been to Eureka many times as a child and teenager but I don't think I've ever seen the downtown before. I walked a couple blocks, but I didn't have time to linger. It was getting late and my goal was to set up camp in Trinidad and look around before it got dark. As I said, I was pressed for time so I didn't go in. Next time, for sure. 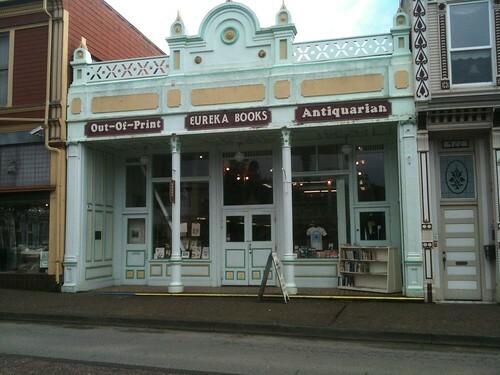 Emma tells me it's her son's favorite bookstore (he's a college student up here). 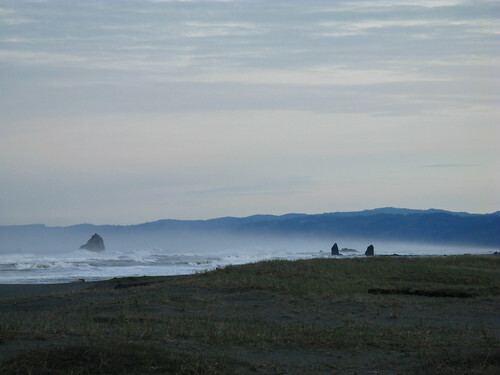 I got back in the car and zipped up to Trinidad a few minutes north looking for a campsite at Patrick's Point. State park campsites are usually open year-round, and there was nothing at the entry gate about being closed, but all the campground parking lots had the gates locked shut and "closed for the season" signs up... I was confused. I'm still confused. Was it really all closed for camping? Well, I find it hard to believe. Flummoxed, I got back on 101 not sure of my next move. I thought about driving all the way to Crescent City and getting a room at a Motel 6 or something. I had a long way to go the next day (Tuesday) so that would have cut down considerably on my travel time. Alas, the very next exit north of Patrick's Point had a sign for camping at Big Lagoon County Park (going north, a left turn from the fast lane), so that's what I did, saving $15 from the cost of a campsite at Patrick's Point in the bargain. I got my tent set up just in time to catch dusk over Trinidad Lagoon. 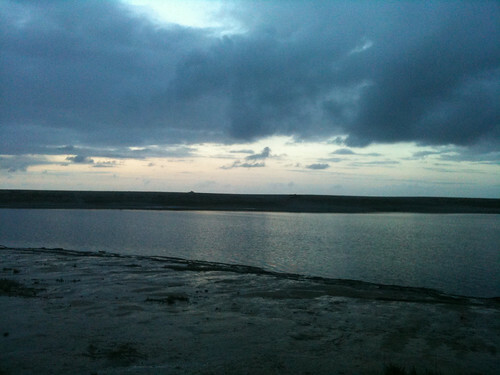 It was too early in the morning as I was leaving to take pictures of the picturesque neighborhood around the Lagoon. I would like to come back for that someday. 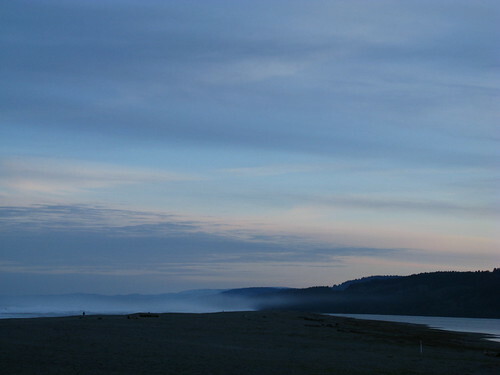 The beach was exquisite in morning mist. 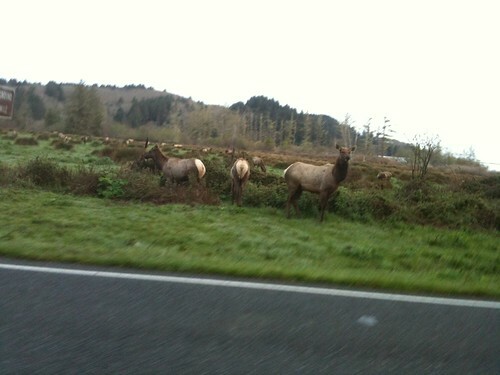 Traffic on 101 (four cars and a truck) had to slow down for some tule elk crossing the interstate. 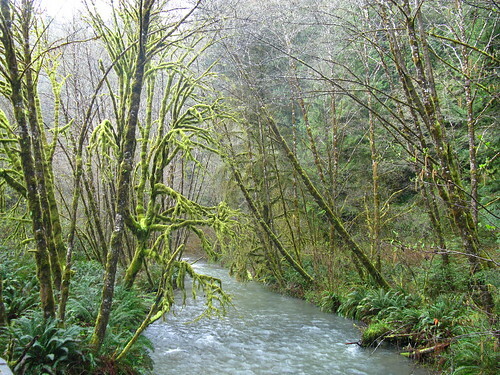 My next stop was totally spontaneous, but who could resist a name like Lost Man Creek? 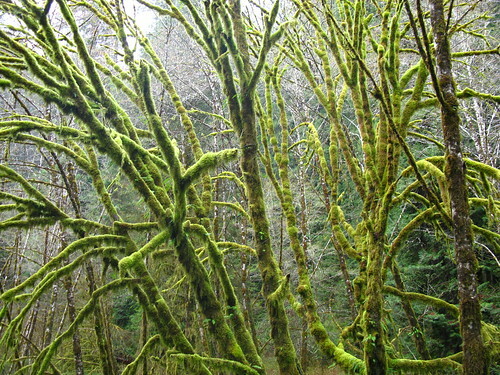 Of all the forests I've seen, I found this one to be the most primordial and other-worldly. 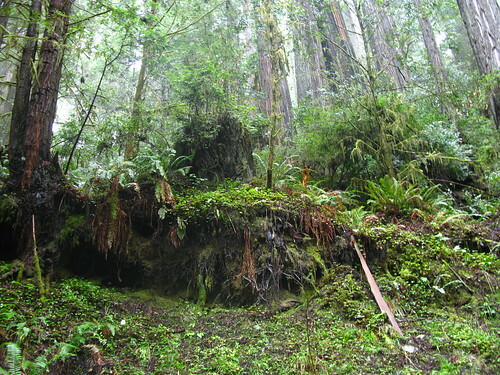 Since getting home, I've read up on Lost Man Creek and it does not get good reviews for hiking. Apparently, it's boring once you get a few miles in, past the old growth, where there has been extensive logging. I would still recommend you stop here and just visit the first two miles. I took 50 pictures and only a handful are usable. Go see it for yourself! 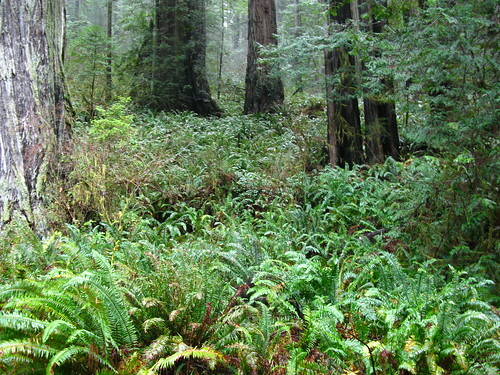 I continued north, taking the "scenic alternate" through Prairie Creek Redwoods (Ha. I would rate 101 itself quite "scenic" through these parts). I got out and did two 2-mile loops, but nothing that I think needs treatment here. 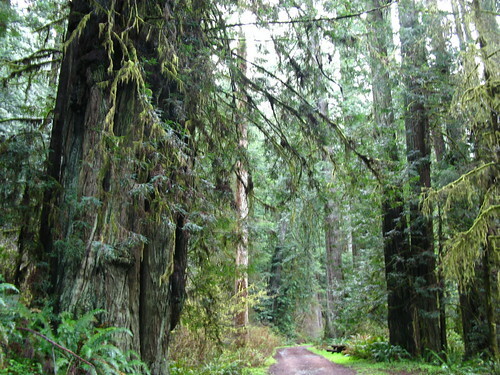 Imagine really big redwoods. 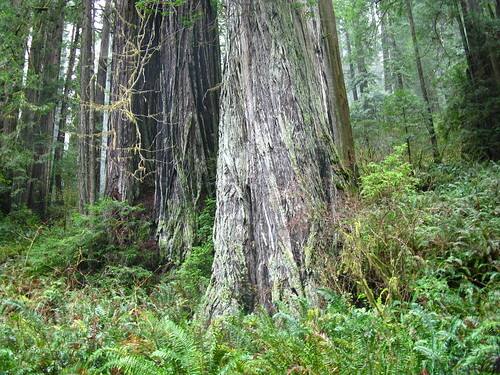 Click back a few pages to Founders Grove and Rockefeller Redwoods in case you've forgotten what groves of giant redwoods are like. Same thing in Prairie Creek. 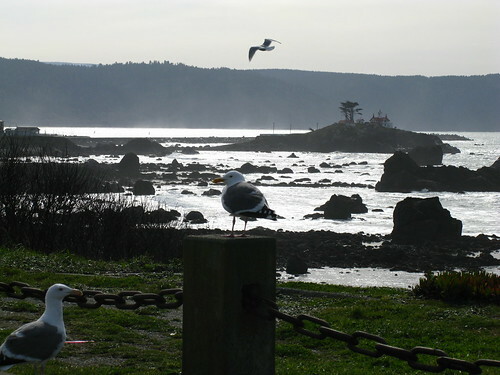 My last California stop was Crescent City where it was past-time for coffee and breakfast. Pickings were slim and I had an omelette at Denny's--the last booth on the right, before the restroom. 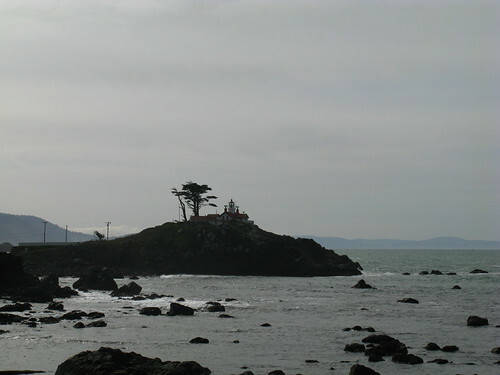 Crescent City's harbor got thrashed by the tsunami two weeks ago. I didn't go looking for evidence of that. 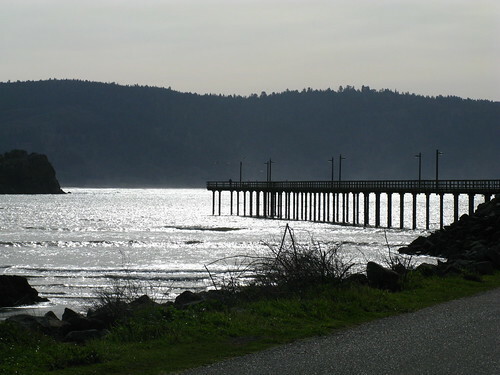 Here are a few pictures I took from the car before I got back on the road heading north, to Oregon.